Videogram: "Test Subject 011" 7"! I'm excited to finally be able to announce that Videogram's Test Subject 011 7" has been sent off to the pressing plant, thus officially launching the SelectaVision label! The preliminary release date is set to January 2018 and pre-orders are being accepted! 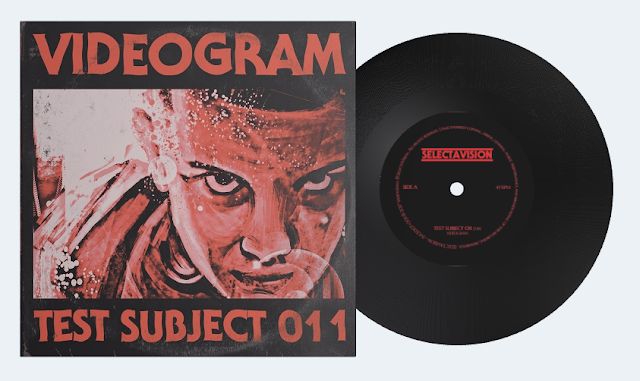 The two-track Stranger Things-themed 7", that totally embodies "the otherwordly sci-fi eeriness of the show and characters, both in sounds and in it's artwork" (Popcorn Horror), is available via SelectaVision's page on Qrates, and comes with a bonus download of the four-track digital Bandcamp EP. There's a limited amount available to pre-order, so you better act fast! Stores and distributors should get in touch for wholesale orders. Make sure to check out the all-new Test Subject 011 video as well. Heavy on the sci-fi influence, you'll find it on both Videogram and SelectaVision's official YouTube channels here and here. Make sure to follow SelectaVision on Facebook here to stay up to date!